ecoPayz was one of the world’s first eWallet providers. It gives you the ability to transfer money fast, easy and most importantly free. Their service gets even better if you choose to open your ecoPayz account through us. Join our ecoPayz Cashback Deal today and earn up to 0.65% Cashback on all your transactions plus get an instant Gold VIP upgrade! As a member of our ecoPayz Cashback Program you will receive from 0,5% up to 0.65% cashback. But that’s not all. Your account will also be automatically upgraded to ecoPayz gold VIP status, with multiple currency accounts, right after your account verification. You will also not have to wait multiple days for your account to be verified. As a matter of fact, your accounts will be verified in a couple of hours after registration. Start Earning up to 0.65% ecoPayz Cashback Now! Instant gold VIP Status and a free MasterCard. 0.65% Cashback on all Transfers. If you already have a ecoPayz account, submit your details below and start earning Cashback today! To help you register, set-up and verify your ecoPayz account, we have prepared the following simple 3 step registration guide. CLICK HERE to start the ecoPayz registration process. Make sure to sign-up using our link to be eligible for our special ecoPayz Benefits and ecoPayz cashback program. You will be redirected to the ecoPayz registration form. 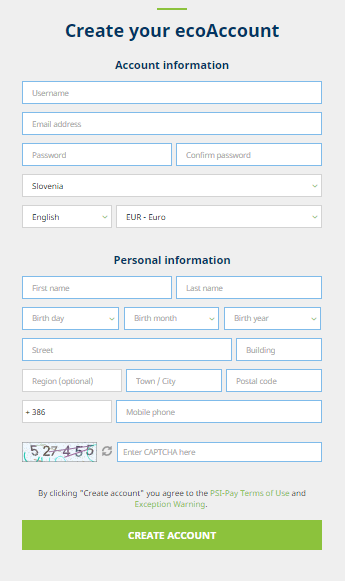 Once there, simply enter your email address, choose your country of residence and state. Submit your ecoPayz account details below and start earning Cashback today! Note that in case you submitted an old account and it is already verified, there is no need to send us those documents above again. You will still be eligible for an instant gold VIP Status upgrade, as well as the highest deposit, transaction and MasterCard limits. Check the video review bellow to learn about all amazing features of ecoPayz and our Cashback Program. ecoPayz takes a unique approach to the VIP Program. They offer 5 different VIP levels but the requirements for reaching a higher VIP status are not based solely on the transaction volume, but other factors as well. The lowest and standard level for all customers. After credit card, address and identity, verification. Instantly with us. Platinum for 30 days and 250,000 EUR in transfers. After 10,000 EUR transfers with us. The ecoPayz PrePaid MasterCard is called ecoCard. You can use ur for withdrawals at all ATMs, or payments in shops that accept MasterCards. All our ecoPayz Cashback Program members receive the ecoCard completely free. Meaning, that your withdrawals will only cost you a small ATM fee. All available deposit and withdrawal options that are available to ecoPayz users are listed in the table below. 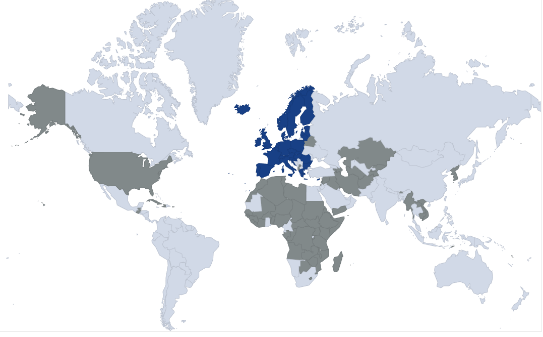 While only a few countries in the world are completely restricted (grey), ecoPayz PrePaid MasterCards are only available in the SEPA region (dark blue). For a more detailed view, refer to the map below. ecoPayz offers extremely fast and reliable support. You can contact them via telephone, email or live chat. In addition to that, our members get access to our dedicated ecoPayz support that will help you find a solution for any problem in no time at all. Founded in 2000, ecoPayz is one of the oldest eWallet providers on the market. They offer their services on all relevant markets, like online poker, forex & binary, online gambling (casino, bingo, etc.) and fantasy gaming. Transferring money with ecoPayz is fast, easy and free. Additionally, you can access your funds at any time with their free prepaid MasterCard (ecoCard).